Abstract: ASUS' P5N32-E SLI Plus motherboard packs in a tone of Serial ATA II ports thanks to the nVidia nForce 650i MCP Southbridge. In the final benchmark of the day, the Asus P5N32-E SLI Plus motherboard puts on another great showing. It's definitely a high end gaming platform, so as along as you equip it with a fast videocard you're going to be very happy with its capabilities! If you want to put together a nice PC platform for gaming, your options are pretty much limited to an Intel Core 2 Duo processor, and most likely a nVIDIA nForce 680i SLI Intel Edition based motherboard. You simply can't do better than that right now. If you do not want to mortgage the house though, you should check out what Asus has done, its new motherboard competes easily with the nVIDIA nForce 680i SLI Intel Edition. The Asus P5N32-E SLI Plus has a comprehensive feature set that we've already gone over pretty extensively - so I won't rehash that. Of course, it also supports SLI, and each of the primary two PCI Express x16 slots run at full speed. The white slot operates at PCI Express x8 for other high bandwidth devices. The motherboard itself is a breeze to work with, the documentation is spot on, and the silent chipset cooling system is a nice touch. As you saw, the Asus P5N32-E SLI Plus motherboard was very quick in all the benchmarks PCSTATS tossed its way. If you primarily use your computer for workstation office tasks or 2D applications then the P5N32-E SLI Plus is definitely overkill. 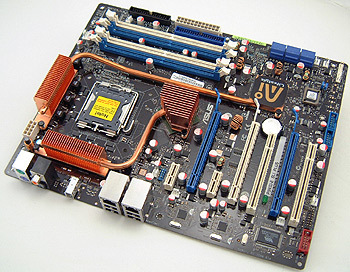 While it's one of the fastest motherboards PCSTATS has tested, you are not going to notice the difference between this motherboard and an entry level board when working in Microsoft Word. The Asus P5N32-E SLI Plus is also one of the best overclocking Intel motherboards to pass through the test labs. Reaching a sky high 472 MHz is quite a feat! With the ability to push the CPU voltage to 1.9v and memory voltage to 3.425V, you know Asus means business when it says this board is overclocking friendly. If you are careless with the voltage options you will damage hardware, so take it slow and cautiously. Any way you slice it, the Asus P5N32-E SLI Plus should be on your list of motherboards to check out. It has pretty much everything a modern day business computer needs, overclocks like there's no tomorrow for the tweakers, and slots in as one of the best performance-oriented nVIDIA nForce 650i SLI motherboards on the market. What's there to loose?